The mystery surrounding the discovery of prehistoric wooden posts on the marshes in Waveney has deepened following the discovery of a third site. 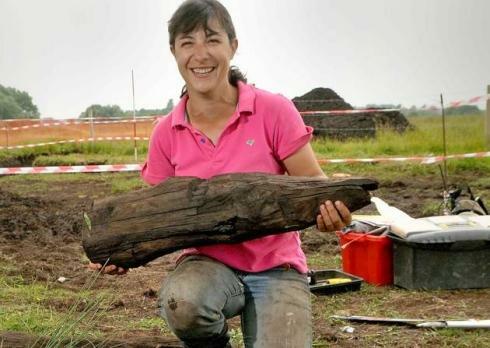 Three rows of Iron Age wooden posts were discovered on Beccles marshes in 2006, prompting experts to undertake a number of archaeological digs to try to unravel their significance. A similar site was found in nearby Barsham the following year. A team from the University of Birmingham has now descended on a third site by the river at Geldeston after similar posts were unearthed as flood defence work was carried out last summer. Dr Ben Gearey, a lecturer in archaeology at the University of Birmingham, said the sites are “pretty rare” and are all likely to be linked, with Barsham and Geldeston appearing to be aligned with each other across the river. “There are not many other sites in the country like this,” he said. Talking about the Geldeston site, he added: “We seem to have a line of posts, possibly a triple line of big oak posts. “We do not have a date yet, but the posts have tool marks on them typical of iron tools, so it is looking like probably being Iron Age, maybe Romano-British. We have also found fragments of Romano-British pottery. It is certainly late prehistoric. “The Beccles site is late Iron Age, and has been dated very precisely to 75BC through dendrochronology. Dr Gearey and his team are spending three weeks investigating the site at Geldeston. Their dig comes to an end this week. Six students and four members of staff are taking part and so far they have discovered about 13 oak posts of different shapes and sizes preserved in the peat. Dr Gearey said there are various ideas about the significance of the posts. “The sites all focus on the river,” he said. “There are various thoughts and feelings and we have sat around in the evenings and talked about it. The river is a barrier to movement, but also facilitates movement of people and trade, so there is that element of providing access to the river. “In prehistoric times you could not have walked down to the river like we do now, so there is the element of maybe demarcating a route way to the river. “Another idea is that on the river itself it is quite hard to see where you are in this landscape if you are in a boat. It is not known whether the posts might have supported some kind of structure, but Dr Gearey said that at present it is not thought they did.